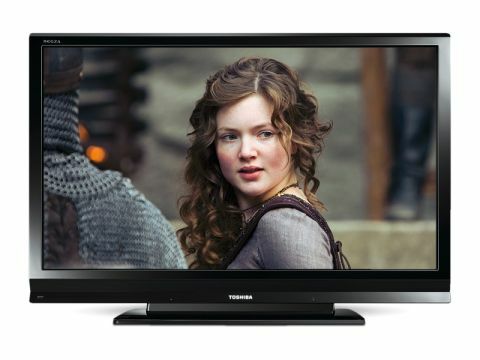 Toshiba's 37AV635D has two major things going for it. First, at £550 it's astonishingly cheap. Second, it's got a brain. Or a Meta Brain, to be precise. Meta Brain is actually the name given to a combination of picture processing tools: Active Vision II, and Resolution+. Of these, Resolution+ is easily the most interesting. This powerful engine has been proven to do a strikingly potent job of improving standard-definition pictures, adding detail and sharpness while keeping a lid on video noise. Active Vision II is a more wide-ranging system targeting everything from colours to contrast, and, though not as revolutionary as Resolution+, it's certainly capable of nudging up picture quality. The 37AV635D's unexpectedly good connectivity, meanwhile, includes four HDMIs, a USB port, and a PC jack. And its onscreen menus enjoy an astonishing array of picture tweaks, including a full colour management system, and an AutoView preset option that automatically adjusts pictures in response to an assessment of both the light level in your room and the content of the image (most TVs consider these two separately). You can also adjust the gamma levels, black/white level balance, and noise reduction routines. In other words, the 37AV635D provides the sort of flexibility generally only found on TVs costing twice as much. As hoped, the Resolution+ processing really delivers with standard-definition fare. Provided you set it no higher than its mid level, it does a startlingly clever, clean job of adding resolution and clarity to Freeview or Sky broadcasts, leaving them looking more 'HD' than they do on any other budget TV we've seen. Pity, then, that the 37AV635D actually looks softer than most when showing high definition. Another problem is that while the 37AV635D's black level response is adequate for normal TV viewing, it's found rather wanting by very dark film scenes. Depth-creating shadow details are in short supply, and a grey mist hangs over anything that should look black. However, with authentic, vibrant colours and solid motion handling getting things back on track, the 37AV635D has to be a temptation for unambitious, cash-strapped buyers looking for a TV to get the best from predominantly standard-definition sources. The 37AV635D's sound, for the record, is acceptable for a budget TV, but nothing more. Its speakers don't distort or rattle, but they don't hit any great heights of clarity or power either, meaning sound seems a bit trapped during loud, dense sound mixes.